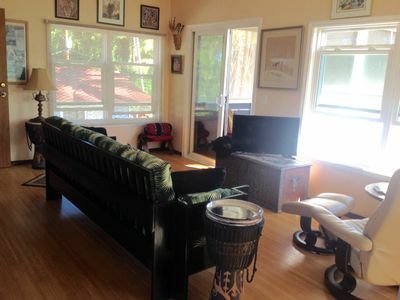 Nice Home, 1 Mile to Volcanoes Nat'l Park, Sleeps up to 13......This house is a great home away from home with comfortable beds, a 40-inch LCD TV with HD Cable and surround sound, three comfortable futon sofas that can double as beds for extra sleeping because this vacation house sleeps up to 13 guests. 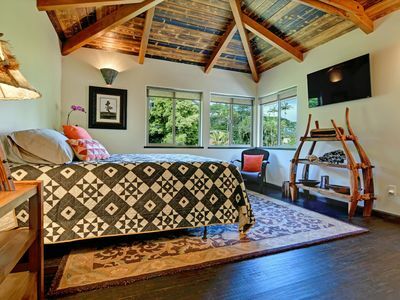 There are vaulted ceilings in the living room and master bedroom. There’s a well-stocked kitchen with stainless steel appliances-just bring up some groceries and you're ready to cook on the gas stove. The dining table seats eight with room for five more at the kitchen peninsula counter. A dishwasher makes for easy clean-up. 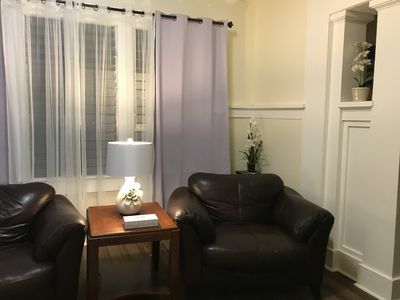 Guests love having the washer/dryer and free high-speed internet access, which is a must for those who need to stay connected. Comfy outdoor furniture are outside for your enjoyment. 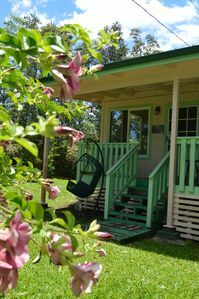 Sleep in cool comfort in the high-elevation of the Volcano rain forest, 3700 ft. We have high quality sheets, warm blankets and comforters and a wood burning stove that can warm the whole house on chilly nights. 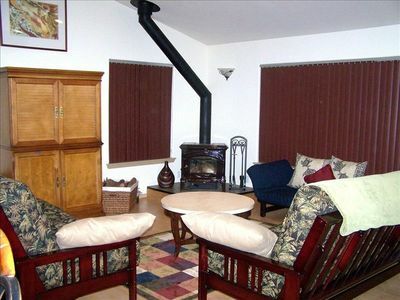 This house is insulated, unlike many others in the area, which can be too cold. 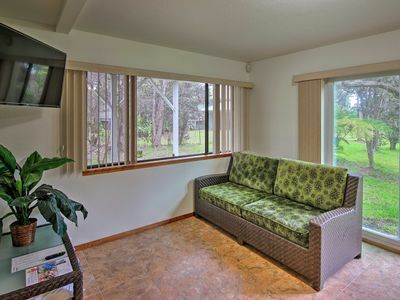 The area is quiet and relaxing; you'll enjoy the native Hawaiian birdsong. 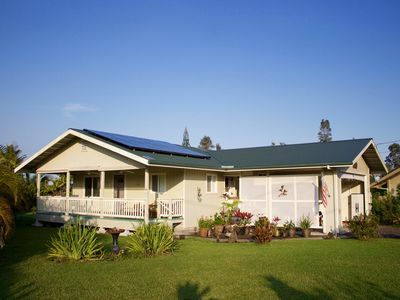 Our lot is nearly a 1/2 acre and has many native Ohia trees with beautiful red blossoms. View the giant Hapu’u fern trees that grow to 30 feet tall, and tropical flowers from every window. 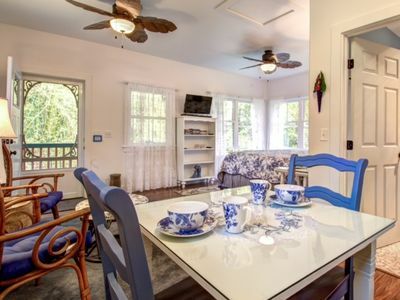 You'll love this house and there's a lot to do nearby, so you'll want to stay awhile. The entrance to Hawaii Volcanoes National Park is about a mile away, but if that makes you nervous, bear in mind the town of Volcano is upslope of the crater and safer from lava flows than other parts of the island. The volcano has been erupting continuously since 1983 and in 2008 a huge steam vent opened in Halemaumau Crater, which can be viewed from different angles at the Volcano House and the Jagger Museum. At the Visitor Center, there's an informative film and rangers can update you on the volcanic activity. There are also free ranger-guided hikes available to admire the impressive steaming caldera that once was a lake of lava. Exploring the park further you'll find sulfur banks, steam vents and a lava tube, which you can walk through. There are also many hiking trails. Visiting after dark you'll see a fiery glow from the steaming vent. 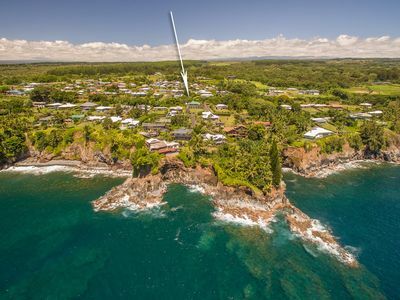 The quaint town of Volcano has a few markets, a gas station, a post office, even a skate park and is home to a Thai restaurant, the Lava Rock Cafe and the Kilauea Lodge Restaurant. 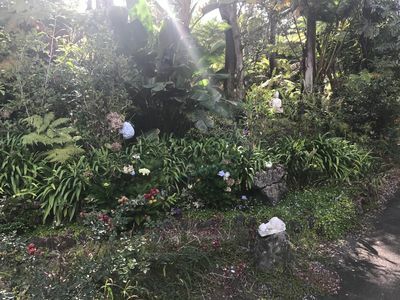 A farmer's market with fresh produce, hot coffee, pastries and breakfast sandwiches is open every Sunday morning, from 6:30-9 a.m.
Drive the Mauna Loa Scenic Road to see tree molds, created when a lava flow encountered a damp tree truck hardening the lava around it. More tree molds are seen at the beginning of the Napau Crater Trail. There's also Kipuka Puaulu (Bird Park), a 30-minute hike through an old growth of forest surrounded by newer lava flows. At the end of the scenic road is a trail head to Mauna Loa Trail, the place people start a multi-day trek to ascend the summit of Mauna Loa. South of the Volcanoes National Park entrance near mile marker 38 is the Ka'u Desert Trail, which lead to footprints, most created during the explosion of 1790 and a few from an earlier explosion in the 1500s. Volcano Golf & Country Club is a few minutes away at a 4,200 foot elevation. This is the Big Island's oldest golf course, dating back to the 1920s. The layout has stunning mountain views. You may see wild turkeys, Nene geese and Hawaiian hawks. Due to the elevation, expect extra distance on well-struck shots. A round of golf is $63. Pele's restaurant is open for breakfast and lunch seven days a week. Clubs available for rent, as are gas and electric carts. The Volcano Winery is a mile past the golf course, with several unusual wines and free wine tasting. We like the Volcano Red. 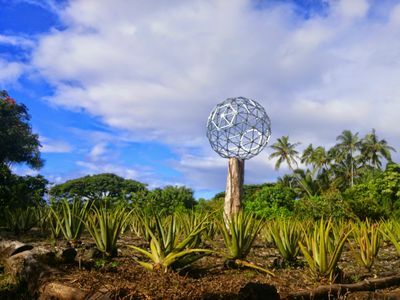 There are many exotic treasures to see in every direction by driving 30-45 minutes. 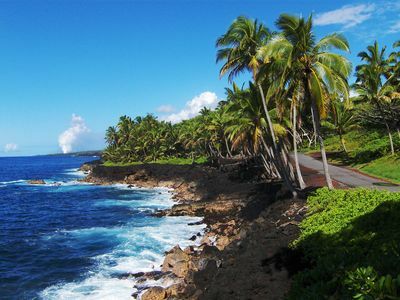 Punaluu Black Sand Beach is popular with sea turtles that can be seen swimming nearby and resting onshore. Going another direction you'll find volcanically heated tide pools, including the popular Champagne Pond. There’s great snorkeling in this area and on the way there is the Lava Tree State Park, full of lava tree molds. 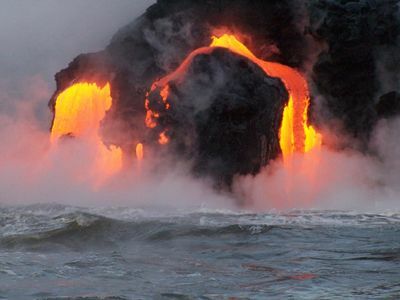 Keep going around the flank of the mountain if you'd like to see where the lava is currently entering the ocean, best viewing is after dark & flashlights are needed. 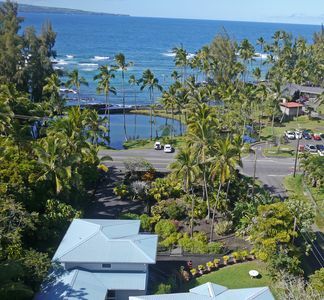 Hilo is just a half-hour away and is home to Pana’ewa Rainforest Zoo & Gardens with petting zoo hours from 1:30-2:30 p.m. on Saturdays. Rainbow Falls is beautiful and there’s also the World Botanical Gardens & Umauma Falls, a triple-tiered waterfall. The Lyman Museum has an incredible display of Hawaiian geology, plant, animal and fish life and there’s also the Pacific Tsunami Museum, many restaurants and shopping opportunities. 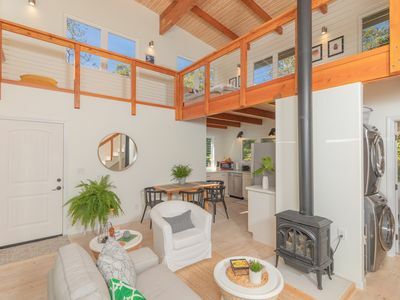 Very Cute And Clean Cottage Home, With Hot Tub And Forrest Views! 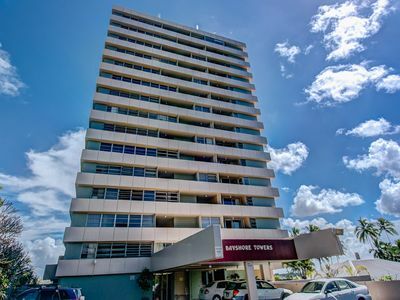 Steps to Beach Park, swim with the turtles, minutes to drive to restaurants. 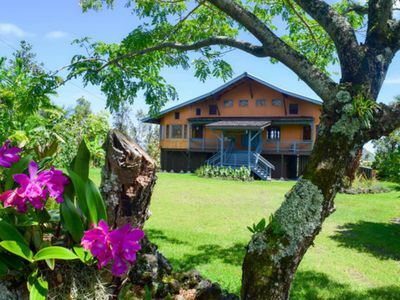 Kehena Treetop Bungalow - Minutes from the New Pohoiki Black Sand Beach! 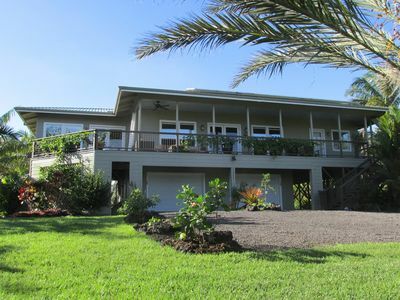 New, Large Vacation Rental Home with Spectacular Views of Hilo Bay. 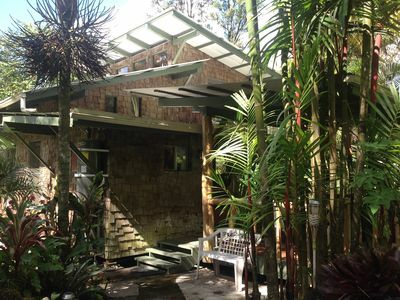 Dancing Bamboo Cottage - Minutes from Hawaii Volcanoes National Park! 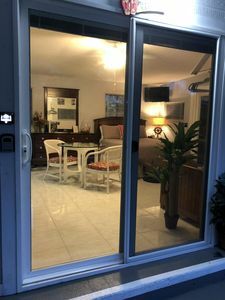 Hawaii Apt on Golf Course w/Views in Volcanoes NP! 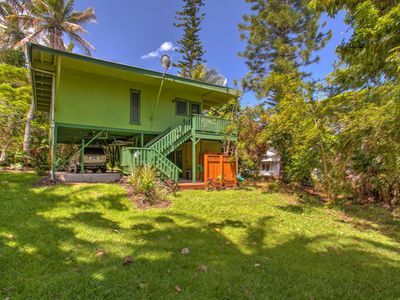 Modern amenities, ocean view, big yard!